The BBC Radiophonic Workshop was created in the pre-synthesiser days of 1958. It was based in the BBC's Maida Vale Studios, creating sound, often from unlikely sources, particularly for BBC drama. As might be expected, a committee was established: the Radiophonic Effects Committee; armed with a £2,000 budget and access to the 'cast offs' cupboard. It assembled rooms full of tape recorders and test equipment which made noises; and mixed in a bundle of imagination. Its birth was thanks to Daphne Oram and Desmond Briscoe. Desmond had been a studio manager; and Daphne was someone who'd begun her BBC work during the War as a 'music balancer'. 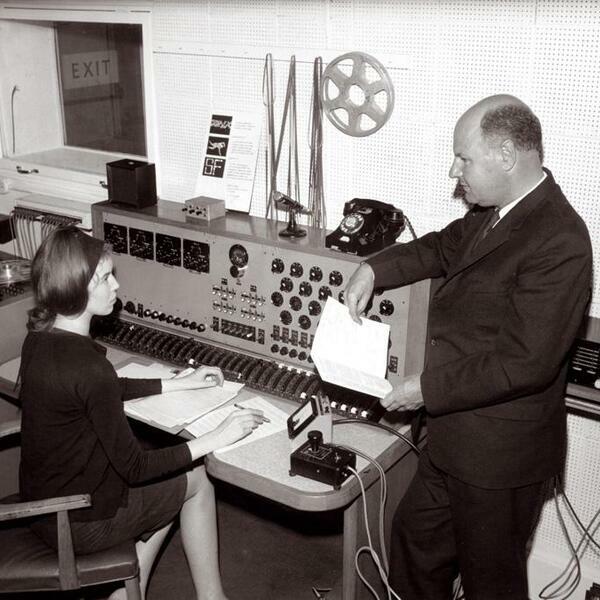 Women played a key role in the Workshop's productions: a later leading light was Delia Derbyshire (heard on this audio). You may have heard the Workshop's early work in both 'The Goon Show' and 'Quatermass and the Pit'. It also lent its talents to many BBC theme tunes; you'll have heard its recordings on both national and local stations, not least a host of convenient jingles for a nascent BBC local radio. I shall not mention Doctor Who; 'cos that is telly. The Workshop closed in March 1998.